Over the past year I've come to love American brown spirits, most specifically Maker's Mark bourbon and Templeton Rye. That Templeton, in fact, is probably my favorite liquor of any kind. But I've reviewed very few whiskeys at the blog because as much as I like what I like, I don't try that much different stuff and don't have nearly the frame of reference that a lot of guys do. Still, I guess, the only way to develop that kind of context is to keep trying different beverages, and I might as well record my thoughts here when I taste something new. 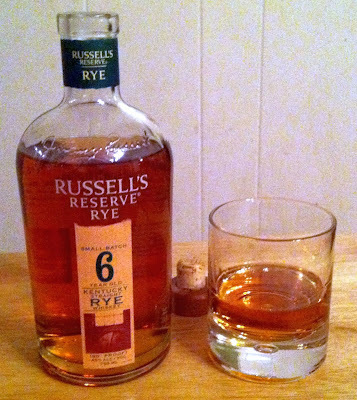 Tonight I picked up a bottle of Russell's Reserve six year old rye, form the distiller's who make the more common and less interesting Wild Turkey bourbons. I'm not much of a Wild Turkey fan, to me there is little to distinguish Wild Turkey from the other liquors on the middle shelf. But Russell's Reserve Rye is better, and while it isn't going to become a favorite of mine, I'll certainly enjoy this bottle. Russell's Reserve pours very pale amber and has a sweet, mild aroma. This rye doesn't really distinguish itself in the nose, especially when compared to Catoctyn Creek's Rye, with it's huge rush of butterscotch and caramel. The flavor of Russell's Reserve is milder and more ... well, reserved ... than I'd have expected from a 90 proof whiskey. There's the spicy rye I expected, and some oak and honey notes, but none of it is particularly pronounced. Templeton is more complex and richer, and will remain my rye of choice. But I do like Russell's Reserve better than Knob Creek's rather burned and overly polished rye. On a five scale, with Templeton and Catoctyn Creek tied at solid fours, I'd give Russell's Reserve a decent three or three and a half. 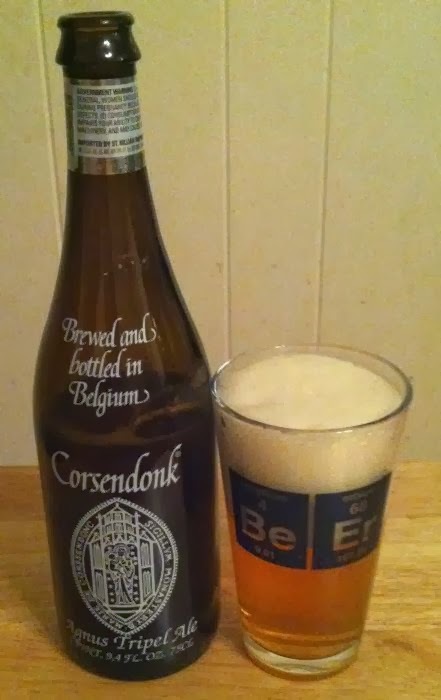 Corsendonk Agnus Abbey Tripel is a strong example of the style. It pours with a bright golden body, lots of carbonation, and a ton of foamy head. Fruit and citrus aroma; raisins, a little bit of coriander. That Belgian yeast just brings it every time, nothing else is quite as nice in the nose. The flavor is bright and crisp, lots of fizz, and the malt gets big at the swallow. Only a hint of booziness gives away the ABV. But if you finish this 75cl bottle, you'll feel it. 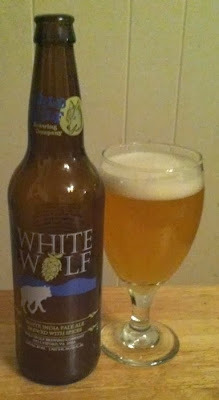 This is a clean tripel ale that would pair well with just about anything. New Belgium Spring Blond Belgian style ale isn’t bad. It pours an extremely clear yellow. Not much suds. 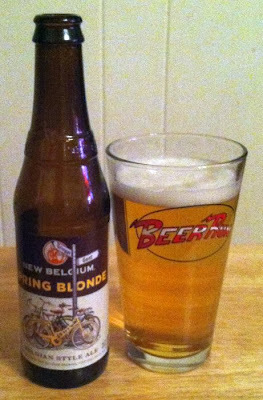 There is a slightly sweet, banana-like aroma like you’d expect from a Belgian, but it’s very subtle. Not a strong presence in the nose at all. 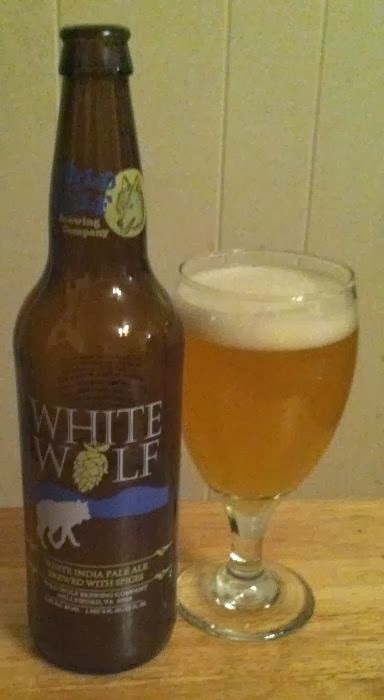 The flavor is bright; a lemon citrus zest up front and then some bitter bite from the hops in the finish. I probably won’t have this again, but I did finish this bottle.